DS | Binary Messiah - Reviews for Games, Books, Gadgets and more! 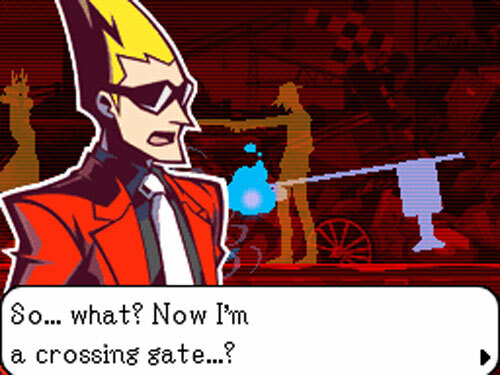 For almost 10 years I have been dodging Phoenix Wright, but I can’t fight it any longer. I know all about the characters and what the game is like, but I had no clue that the story was this deep and interesting. Honestly, Phoenix Wright’s biggest flaw is the lack of gameplay and frustrating puzzles, and sometimes no clues on what to do. Despite that, you are going to play this mainly for the story and characters. Phoenix Wright is a new attorney straight out of law school. You start out with your first trial and get the trial contradiction puzzles nailed down first. 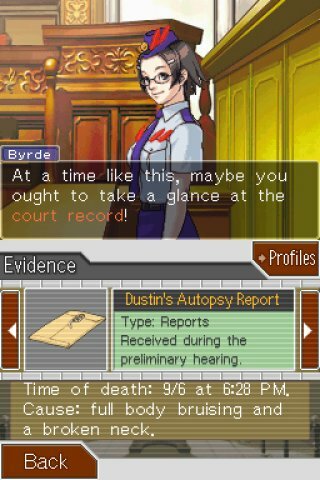 You are presented with a court record that keeps track of all evidence. Witnesses will take the stand and you need to press each sentence in their testimony to point out inaccuracies. Wright and the prosecutor will go back and forth with the judge and once you’ve pressed every statement you need to find the contradictions. This is where things get frustrating. Sometimes it’s pretty obvious and it feels good nailing their false statements, but 60% of the time I had no idea what to do. Most of the statements would be very vague and not give you many clues as to what evidence can catch them in their lies. However, each case and witness varies. Sometimes testimonies will be restarted and you need to find new contradictions. It sounds confusing, but is both fun and frustrating at the same time. Once you finish out a trial or you are on a new day you need to investigate. This is the other half of the game. You go from place to place examining the area for clues, talking to witnesses, and sometimes showing them stuff to get things out of them. This can also be frustrating because you won’t have any idea where to go sometimes or what to show. On top of all this aimless frustration, there’s hardly any gameplay. You are reading about 80% of the time and the gameplay just consists of selecting things. Later on, you use the mic a bit, but other than that it’s mainly just a point and click adventure at heart. That’s not to say any of the game isn’t any fun. The story and characters are gripping, the 5 cases you end up doing are very interesting. Each case will take about 2-3 hours to complete so there’s quite a bit of play time here. I just wish they weren’t all the played out the same. Do a trial, investigate, do a trial, investigate, talk, talk, talk, examine, show some evidence, talk some more. 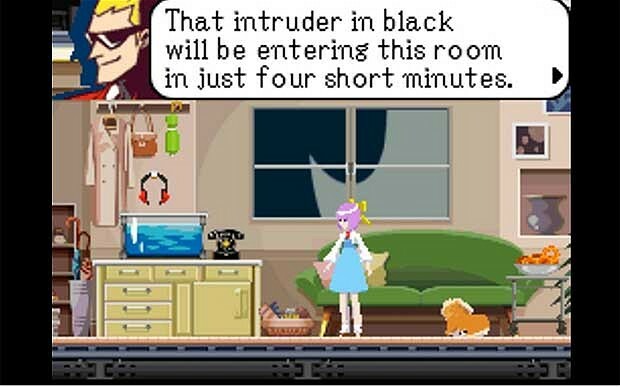 Point and click adventure fans will love this game, but if you want action you’re out of luck. The trials tend to get heated and it’s pretty fun to watch everything unfold. The stories have twist endings and will leave you hanging all the time, but you won’t want to stop playing. 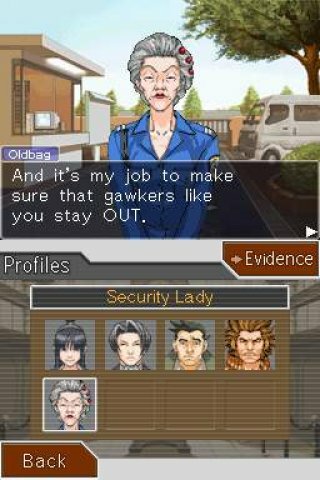 Ace Attorney is a fun adventure game with great characters and stories, but there’s very little gameplay. What’s here is frustrating puzzles of finding contradictions from witnesses testimonies and your evidence. Outside of that, you will wander aimlessly during investigations trying to figure out what to do and where to go. 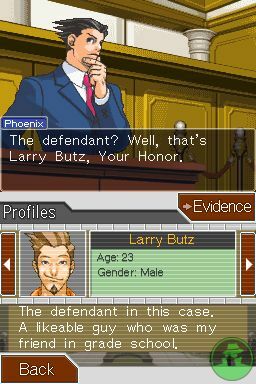 Phoenix Wright is a great step in the right direction for the DS but needs more to make it truly amazing. The last great game I remember playing where you were a ghost was Geist for GameCube. Ghost Trick may not be an action-packed shooter, but it does have an interesting story with whacky characters and fun mechanics. You are trying to solve a murder mystery for yourself. You wake up as a ghost out of your body and need to find out who killed you and why. As you play through the 17 chapters the story unfolds more and more and starts out as a gripping story until the very end where it just falls apart and becomes hard to follow. Despite that, the game has great art and animation and is worth a play through. The main mechanic is playing as a ghost and being able to rewind time, change people’s fates, and manipulate objects. When someone dies you can talk to their core where you find out a little about them, you can then rewind time to 4 minutes before their death. Once you see the clip it plays out again but you must manipulate objects to prevent their death. This is a really neat mechanic and very original. These all are puzzles and they get harder as the game moves on. One person may end up dying from a trap that was set up and you have to stop one part of that trap before the person is killed. When you are in the ghost world time stops and you can see all the objects you can hop too. However, you have a limited reach so you need to manipulate other objects to get closer such as knocking stuff down, opening things, and various situations like that. The puzzles end up becoming multiple screens and you sometimes have to travel to whole new areas mid-puzzle. You can travel around via telephone lines, but you must be on the phone when someone calls at a critical time to trace the call. This is all really neat and fun, but after a while it kind of gets stale. I hate to say this because this is a one of a kind game on DS. It uses the touchscreen in a unique way, but all you do are these ghost puzzles. There’s more talking than gameplay which will bore impatient people. 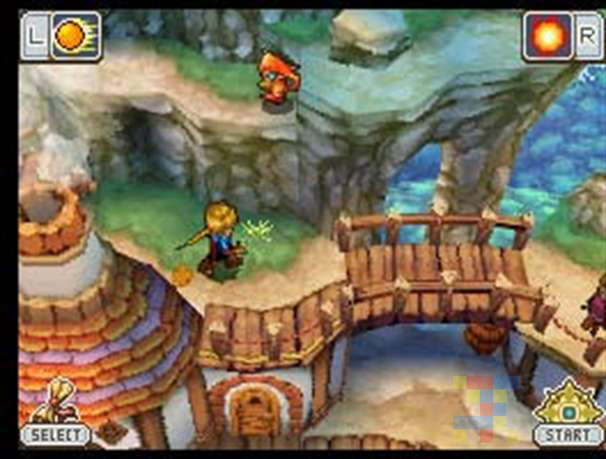 Some cutscenes can go on for nearly 20 minutes. When you do start playing you are constantly interrupted with overly drawn out dialogue to tell you what to do. A lot of the times the puzzles can be nearly impossible to figure out or require constant trial and error. The occasional puzzle is thrown out there that is different — some are timed and some aren’t. Towards the end you get to play as two different ghosts, the other has the ability to swap objects. This adds another layer of depth and difficulty to puzzles, but most can be figured out after a few tries. I actually got really attached to the characters which are surprising. For the long length of the game (nearly 20 hours), the characters were well developed, but the big flaw was revealing everything at the final 3 chapters then adding another complete twist at the very end to overcomplicate the story. It all flows perfectly fine until the end where it just falls apart. It gets so confusing with all the characters and details you have to remember, they should have spread it out more. 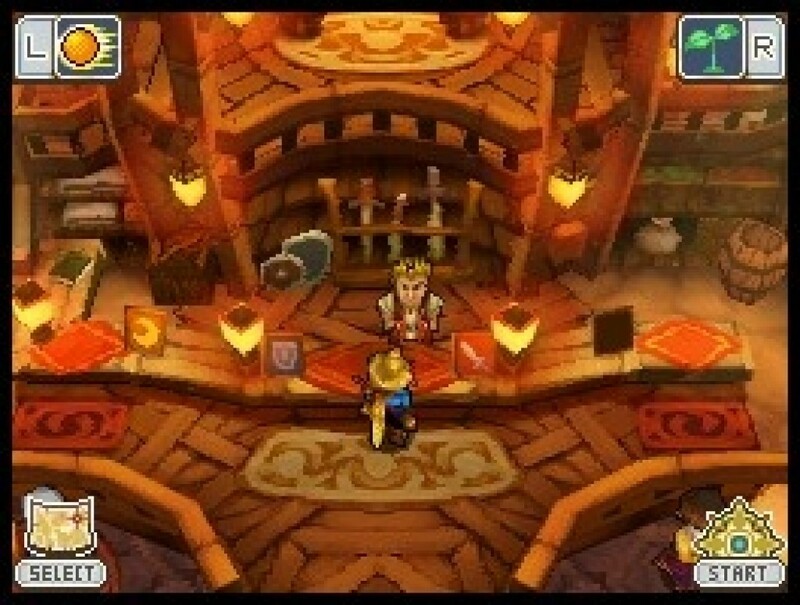 Despite this major flaw, this remains one of the most story rich games on DS. There are many puzzles in the game and it is well worth a purchase, but the impatient may not like it. 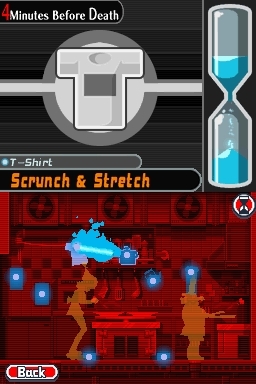 Overall, Ghost Trick is a unique game with original game mechanics that are repeated way too often. The story and characters are great and memorable, but the story falls apart towards the end and gets convoluted. There also is zero replay value because there’s no collecting and no extra endings. Once you beat the game you are done for good. I also didn’t like the poor balancing of puzzle difficulty and the high level of trial and error. 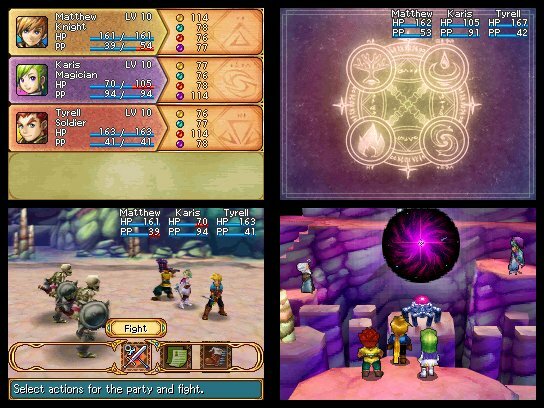 If you can look past all this you are in for one of the best games the DS has to offer.